Telegram users began to receive messages with a proposal to buy yet existing cryptocurrency messenger GRAM (GRM). Fraudsters seem the creators of blockchain‐system Telegram Open Network (TON) and prompt users to register on the website and buy a 30 thousand tokens for $5 million (283 thousand) to become the first holders of the cryptocurrency Telegram, which will be used for settlements within the network. The invitations will contain links to a fake website TON. The resource describes the process of pre-sale of tokens, which is the need to gain $ 30 million to launch the cryptocurrency until February 1, 2018. Maybe the scammers have intensified in the recent publication of the network of official document entitled “Telegram Open Network”, signed by Nikolai Durov, one of the founders of Vkontakte and brother of Pavel Durov. The document is dated 3 December 2017, consists of 132 pages with a very detailed description of the services on the basis of the blockchain, which is scheduled to launch on the basis of the messenger Telegram. We will remind that earlier the information that the Telegram is being prepared for the ICO and use of blockchain, said the former employee of the company Anton Rosenberg. Pavel Durov has not directly refuted this information, but several times it was reported that the official information will be communicated only by official channels or the Durov. Farmers cooperative LavkaLavka intends to raise 300 million rubles of investments from suppliers of farm products in exchange for 51% of the business. This was told by the owner of the company Boris Akimov. The funds raised will be used for three-fold expansion of the network – opening period of two years, about 20 stores and cafes LavkaLavka in Moscow. As part of the reorganization, all of the shops, cafés, online shopping, restaurant, markets and cooking go into a new company: the founders of LavkaLavka it will be 49% and 51% will be distributed between 10-20 farmers in proportion to their investment. Operational management will be engaged in established consumer supply cooperative «Lakalaka». It will include all the founders, each will have one vote regardless of shares. According to Akimov, with several farmers of the agreement already reached. The business reorganisation is planned to finish in two months. To date, LavkaLavka runs three shops and three shops-cafe in Moscow in may will see the opening of two more facilities. Two market co-op are located in the Moscow and Tula regions. The current parent company, JSC «Lakalaka», 34,56% owned by Boris Akimov, 31.6% Alexander Mikhailov. According to own estimates, the network covers about 10% of the market of production of the small organic farmers whose annual turnover amounts to 5 billion rubles. Recall that from 1 January to 18 February 2018 passed ICO LavkaLavka, which attracted more than $16 million Thus, the company managed to overcome the maximum compensation fee set for the platform BioCoin ($15 million). The new York hedge Fund Tetras Capital published its bearish thesis on Ethereum, which predicted a future decline in prices of cryptocurrencies. While bitcoin has the most potential, says the company. It is clear that no one investment Fund can not command the market and to short a separate asset. But posting a bearish call, he can attract the attention of other traders and try to convince them of his position. At a certain share of this success can be enough to make a pessimistic prediction a reality. «The recent decline in the price of ETH implies that speculation, which led it to new heights over the past year, exhausted. Like the ETH have benefited from irrational exuberance, it inevitably will suffer further, with the growth of the market. We believe that the current price of ETH is still too high and still well separated from the current and the next technological state of Ethereum. Our research led us to the view that the market and technology is still too immature to satisfy the current market price. This emerging asset class has soared due to speculative views, and we believe that the current market is underdeveloped in order to properly assess the risks or General economic problems,» – says the publication Fund. The company believes that Ethereum does not have the same critical characteristics that are required for a leading storage cost. Therefore, it is unlikely to ever be able to get around bitcoin, not to mention the other dominant on a world scale assets such as the greenback and gold. Calling to take a bearish position on Ethereum, the hedge Fund opposes the optimistic predictions of supporters of the ETH, such as Coinbase CEO Brian Armstrong (Brian Armstrong). However, recently even acne Buterin was forced to admit that Ethereum has problems, when noted, because of spam in the network of gas spent about $15 million, which led to increased commissions. «We believe that the coming months will be extremely revealing about the future of Ethereum. The load on the network to use (DApp), competition (alternative DApp platforms) and regulation (ICO) will test the speculative hype and price ETH», – concluded Capital Tetras. With 42 full-page version of the report the sub-Fund can be found here. At the time of publication of news weighted average rate of ETH, according to CoinMarketCap, was $499,47. During the day, the cryptocurrency has grown by 5.44%. Owned by brothers Winklevoss bitcoin exchange Gemini announced support for Bitcoin Cash (BCH). — Gemini (@Gemini) 7 grudnia 2018 R.
The possibility of depositing a new asset will appear on December 8 and the next day users will be able to trade BCH in pairs with bitcoin, US dollar, ether, Litecoin and zcash for. Representatives promised «in the coming weeks or months» to consider the possibility of adding Bitcoin to the SV, which is the main competitor of Bitcoin Cash. 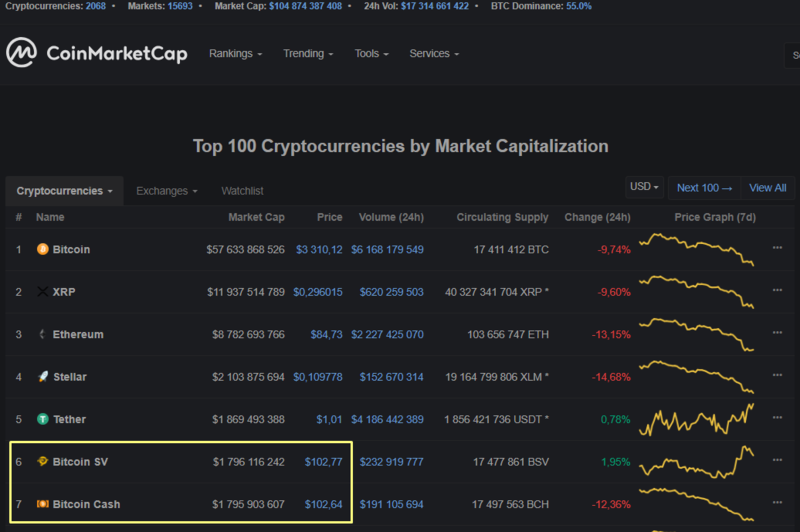 According to CoinMarketCap, currently the price and the capitalization of these assets almost on the same level. In Gemini emphasized that adding support for Bitcoin Cash became possible thanks to close cooperation with the Department of financial services of the state of new York. We will remind, in October Gemini, the exchange has added support for Litecoin. Solutions provider in the field of tokenization assets Neufund announced a partnership with hardware manufacturer purses Ledger. Ledger is excited to announce partnering with @neufundorg to work on creating a secure framework focusing on managing security tokens. We aim to create the safest, user-experience for investors regarding security tokens. — Ledger (@LedgerHQ) 6 grudnia 2018 R.
The companies intend to jointly establish a framework for security tokens. Released with a set of protocols Neufund assets standard ERC-20 will be supported by the Ledger application is Live. «Currently, Ledger hardware wallets are the most secure way of investment and management with a set of protocols Neufund. When working with 7-9-digit numbers safety is the main priority. To provide investors with the ability to manage their equity-tokens is standard ERC-20 directly from desktop applications will be a breakthrough in the methods of interaction with scriptactive», — said CEO Neufund Zoe Adamovich. Note that the details of the infrastructure Ledger is already integrated with the German platform Neufund. So, investors can create accounts and manage them using the wallet Ledger. We will remind, in August about the partnership with Neufund announced the Polish bitcoin exchange of BitBay, who were forced to moved to Malta because of problems with the banking service. Japanese financial services Agency (FSA) issued the third order on the improvement of the company’s business Tech Bureau, the operator hacked last week of crypto currency exchange Zaif. The financial regulator has considered the investigation of a burglary that resulted in losses of nearly $60 million users and most of the crypto currency exchange, as well as the responses of affected persons are inadequate. At the insistence of the FSA to the operator of crypto currency exchange will have to elaborate on the reasons for and details of the incident, establishing the persons responsible for the burglary, to provide accurate responses to affected customers and a description of measures that will prevent similar incidents in the future, taking into account the previously formulated requirements of the Department. The results of this work the FSA expects from Tech Bureau written reports in time to September 27. At the same time employees of the FSA continued the inspection of the company and may take further measures – up to the limit of the company’s activities and/or the revocation of the cryptocurrency exchanges. Recall that Zaif revealed information about the burglary a few days after the incident. And FSA after cracking the crypto currency exchange Coincheck, the damage from which amounted to $530 million, increases the demands on systems management and security Japanese kryptomere. In February, Zaif there was a system failure that allowed the traders to buy bitcoins for free, and in March and June, the Tech Bureau has received two orders from the FSA. Binance, one of the largest cryptocurrency exchanges in the world, officially announced the launch of a new trading platform in Uganda — Uganda Binance. On the platform will be the first exchange for trading pairs with Fiat currency — Ugandan shilling. Today the crypto currency exchange has opened user registration, the first 20 thousand of them will receive as a reward of 0.5 BNB — internal token Binance. The first month the auction will be held without a fee as a token of appreciation to users for their constant support, said the company in a statement. For withdrawal, users will need to go through the procedure of identification. On the date of the opening of trading on Binance Uganda will be announced later. In April of this year Binance announced plans to participate in the development of blockchain-industry of Uganda by attracting investments and creating “thousands of jobs”. Recall that in early June CEO Binance Campana Zhao (Zhao Changpeng) has announced the launch before year end trading pairs with the Euro. The head of the Department of business development of the company WowBox, a startup owned by Norwegian telecommunications concern Telenor, Kjetil Hugard (Ketil Hoigaard) said in an interview with CoinDesk that the company acting as partner Hubii Network, which this week began its ICO hopes that the technology of the blockchain will seriously alter the media industry, reducing the role of intermediaries between content creators and consumers. WowBox is a news app that was launched two years ago in Thailand and also in Bangladesh and Myanmar, saying in early summer about reach 10 million users. Hubii Network is a decentralized marketplace for media content, based on Ethereum, and intended for direct connection of the owners of the content broadcast networks and distributors of content. It is expected that through such direct communication, and the use of smartcontract, content owners are guaranteed to get more money for their content, while distributors will be able to save on mediators. ICO project began on 24 August, and one of his advisers, the head of the Department for business models Telenor mark Briscomb (Mark Briscombe). At the moment, Telenor is already actually uses tokens to reward its users for the provided content, but they are produced centrally and are easily hacked. However, in fact, focusing on user-generated content, Telenor suggests it is unlikely to completely eliminate the role of professional editors in the preparation of the content. It is possible that such revision in the form of the largest publishers can participate in this marketplace, getting rid of your own collection of custom content, at the same time utilizing own content, a large number which may not find use in the framework of the activities of these media. We will remind that earlier publicly in support of the ICO project Hubii Network was made by the famous American boxer Floyd Mayweather. By December 25, the price of Bitcoin could reach $10 thousand, before the next major market correction. This opinion was expressed by Professor of Economics at the University of long island Panos Manducatis in his column in Forbes. The expert notes that in favor of these findings points to the successful passage of the bitcoin of several «tests» in recent weeks. The first is a «technical test»: overcoming cryptocurrency psychological level of $5000, $6000 and $7000. The scientist believes that this is a bullish signal for investors, who are guided by charts of prices and volumes to determine the direction of market momentum. Another factor, according to Manducatis, is passing the»test wall street»: improvement of the attitude towards bitcoin from the key market players and exchanges. This, in turn, is a bullish signal for those investors who analyzed the «market fundamentals» – key events that can increase the demand for the digital currency. The third is the»Chinese test». Underneath the Professor understands the ability of Bitcoin to recover after the ban on trade on one of the largest cryptocurrency markets in the world. This is also a bullish signal, because it proves that digital currency is able to survive and grow, despite the attempts of governments to destroy it. Another positive for bitcoin factor was the abolition of hard forks SegWit2x, which eliminated the uncertainty surrounding the cryptocurrency markets. These bullish signals have fueled interest in the cryptocurrency, helping her closer to the «tipping point» on the curve of Rogers, in which the demand reaches a maximum, followed by an inevitable decline. It creates preconditions for increase in prices, as the limited supply cannot meet the growing demand, the expert concluded. Recall that Goldman Sachs predicts a rise in prices of Bitcoin to $7941 and analyst Ronnie Moas – up to $11 000. According to Coinmarketcap, at the time of writing the news the average rate BTC was $6602 per coin. The network team of Raiden announced the imminent launch of μRaiden (Micro Raiden) — ready solutions for micropayments on the basis of the Protocol ERC20. It is suitable for applications that support recurring payments. For example, payment for content access, storage, increased bandwidth, computation, etc. Unlike network Raiden, which uses bilateral payment channels, μRaiden will use unidirectional channels to provide frequent, fast, and free of payments between the parties. “Currently μRaiden is external security audit and will soon be ready to use in Ethereum”. ΜRaiden source code posted on GitHub, as well as technical documentation and examples from the developers. Earlier, the makers of Raiden Network has opened access to a preliminary version of the network for developers and has launched a test phase of a product introduction.